You are here: Home / career change / Is Fear of Failure Holding You Back? Today, the hot topic is failure. It’s timely, because I just failed in writing a blog. I’ve been working on a blog for two weeks that was supposed to be posted already, but it flopped. I could say it was a failure, or I’m a failure. Or I could just say that it didn’t work out. I love this topic of failure, because I know how a fear of failure can really limit us. However, when we reframe failure, a world of possibility can open up. I was afraid of learning partner dancing after a mortifying experience on the dance floor at a wedding. Even though I secretly really wanted to learn to dance, I avoided it for years, even decades. I was afraid I would be a failure. When I finally got the courage to take a dance class, it was a real shocker when I didn’t die and I didn’t whack my partner in the face (Lol – that came later!). The world was still spinning, and this thing I was so fearful of was actually rather fun. And dance did open up a whole new world for me. My father’s words really helped take the sting of my “failure” away. It’s not hard to go from failing at something to feeling like a failure to even proclaiming oneself as a failure. The phrase “it didn’t work out” is “failure neutral.” The overlay of judgment is gone, and there’s a free space in which to look objectively at what happened and learn from it. In this way, a “failure” can actually make success more likely, if we use the information as material to build something stronger going forward. If we let the shaming side of failure have its way with us, it will stick us with a surrender flag, drag us into a cave, and seal us in with a heavy rock. 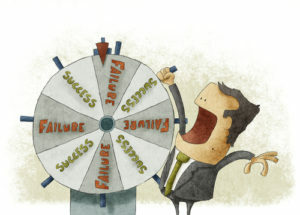 When we’re working on a career transition, this fear of failure can keep us stuck in that cave or scurrying back to it. How do we apply this reframe on failure to have the confidence to grab our spear and join the hunt? One answer to this question comes down to choosing our mindset. In her book Mindset: The New Psychology of Success, Psychologist Carol Dweck introduces the Fixed Mindset and the Growth Mindset. In the Fixed Mindset, we find safety in the status quo and avoid situations that make us feel vulnerable or could involve perceived “failure.” In the Growth Mindset, we seek out and are energized by opportunities that allow us to learn and grow as individuals. How might these mindsets show up in the career transition process? With the growth mindset, we’re able to reframe “failure” as a normal and essential part of life and learning. When something fails to work out, it’s really just neutral feedback designed to give us helpful information. We actually have a tool in failure that helps us be more precise going forward, rather than letting failure become a wet blanket that snuffs out any spark of hope. Winston Churchill captured this growth mindset when he stated, “Success isn’t final, failure isn’t fatal, it’s the courage to continue that counts.” Churchill knew intimately both great success and failure. In our extensive learning process to become physicians, we were in a growth mindset. This mindset took us from not even knowing how to examine a patient to being able to care for very ill patients and save lives (that’s pretty cool!). The growth mindset doesn’t have to end when our training program ends; we can keep it as a way of life. When we see ourselves as learners, we give ourselves more permission to not have to be perfect and to not have to do everything right. In this approach, life becomes more of a grand experiment rather than a final exam. You are never a failure for trying something that doesn’t work out. Whatever you try to do, you will have some new information about yourself, as well as an experience you would never have had otherwise. You get to interpret what that experience ends up being for you. And this goes for the past, as well as the present. When we look at our experiences with the eye of the learner rather than the judge, we have the chance to be in awe of the truth of who we really are. From this place, we are more able to step out of our comfort zone because we realize who we are is not defined by what happens to us, but how we respond to what life gives us. A special thank you to Dr. Vanessa Vidal for first telling me about the Mindset book by Carol Dweck. When I was fired from a hospital job in 2012 at the age of 60, I thought “What am I going to do? This is all I know. I’m too old to do something else.” I had been miserable in that job and my frustrations led to me finally getting into a verbal altercation with the head of the department which led to “your contract will not be renewed.” Did you know calling your “boss” an IDIOT is grounds for termination? Anyway, in my “fixed mindset”, I feared stepping out of my comfort zone of medicine. I feared NOT having the skill sets and failing. But that changed with the help of Dr. Fork. She helped me develop a growth mindset which has allowed me to “explore” options and not worry about failure. Over the past 6 years, I have explored various jobs and been pleased with my progress in allowing perceived failures to guide me to where I am today. I have now transitioned from Anesthesiologist to Physician Speaker and love it! Most importantly, I am happy to NOT be controlled by the fixed mindset of my past. It is cathartic. Bring it on Life! I am eager to learn more! Ha ha! You go Lynette! Thank you for sharing this fascinating story of how you went from the fixed mindset to the growth mindset and it changed your life for the better! Congratulations on being able to transition into being a professional speaker – no mean feat. I have seen the grit and determination and FUN that has gone into your transition. The mindset shift is key, but you have done the hard work to make it happen. An outstanding Post, Dr Fork!! Viewing both the past and the present as a growth experience with the eye of the learner rather than the Judge- how kind and cool is that!! Life becomes more of a grand experiment rather than a final exam- Super Cool thoughts! Dr. Sunder, thank you very much. I am so happy that this post resonated with you! It makes my day whenever I hear that something I wrote was encouraging in some way. All the best to you in your grand experiment of life. Devki, you are most welcome! Thank you for your kind words and support. I have to hand it back to you, because your post on The Doctor’s Crossing about your own transition has been inspirational to many. You are living proof that physicians can pivot gracefully into a new direction and find growth and satisfaction. Thanks for an excellent post – you taught me to make “trust-based” rather than “fear-based” decisions. So much of what people do (or don’t do) is based on fear. I find that things almost never turn out to be as bad as we fear they will. You are most welcome Sue! It’s been a true pleasure to see how you have stepped out of your comfort zone in many ways to navigate a new career direction and find much success and fulfillment. You are absolutely right that our fears are often unfounded, and how helpful it is to make decisions from a place of trust and not fear. I appreciate your reading and commenting.